With great passion, operational manager Richard Capelle, takes care of three bee colonies on 45 meter height. Together they provide us with over 100 kg of organic honey. Since 2016, Richard also experiments with making mead (honey wine). 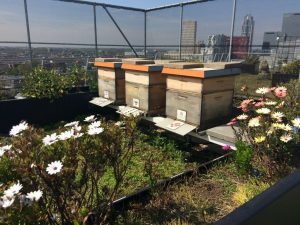 This bee project is part of the company karma philosophy and ads great value to a sustainable environment. You can view our bees 24-7 with this webcam.